A common tomb of the most prominent representatives of Czech cultural and political life was built on the initiative of the provost M. Karlach. The mausoleum Slavín dominates the whole cemetery. The project was designed by architect A. Wiehl. The place this joint tomb was bought from the canonry by the mayor of Smíchov P. M. Fischer in 1889 and he later donated it to Svatobor. The foundation stone was laid on the 7th September 1889 and the building was completed in 1893. The sculptures are the work of Josef Maudr. At the top of the tomb we can see the sarcophagus with a statue of a winged Genius of the Country and on the sides of the tomb there are sculptures of Country the Cheerful and Country the Grieving. There is a bronze crucifix on the sarcophagus, designed by sculptor V. Levý. A prominent Czech writer Julius Zeyer was first to be buried in Slavín in 1901. 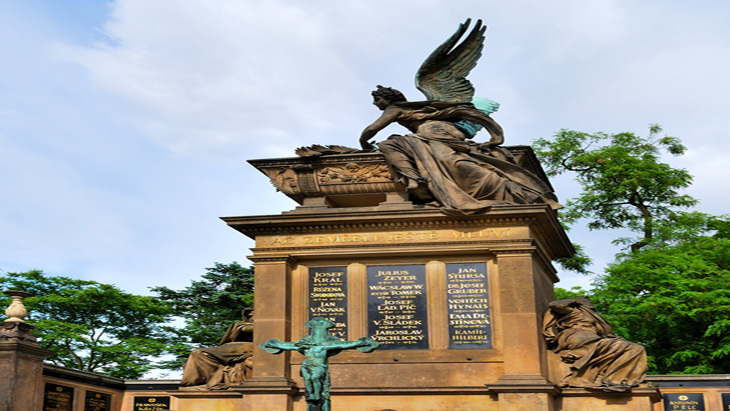 The cemetery is the final resting places of many famous Czech composers, artists, sculptors, writers, scientists and politicians. Just to mention some, the writer Karel Čapek, the composer Antonín Dvořák, or the artist and designer Alphonse Mucha.